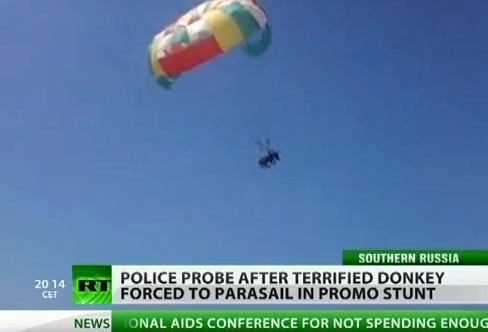 Parasailing Donkey Fake Advertising Stunt or Animal Cruelty? While this just screams fake publicity stunt, it seems a resort in Russia did parasail a donkey last Thursday to promote its private beach. Or, depending upon which reports you choose to believe, a parasailing company did it to promote its own business.. The stunt took place in the coastal village of Golubitskaya. Reports state the donkey brayed loudly and children screamed at the sight while everyone took pictures and no one called the police. It's also reported the donkey landed violently and was dragged for a bit before it came to a stop. Police in Moscow are taking a look into possible animal abuse which could result in a two year jail sentence for those behind the stunt. A video of the event can be seen here of after the jump below. We're just too jaded to take this at face value.